445001 MAN MAN diesel & turbo Turbocharger Programme 2010. Free Download. 445100 MAN NA MAN diesel & Turbo NA Turbochargers Project Guide. Free Download. 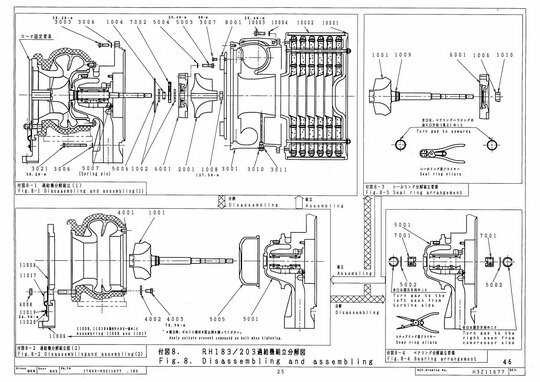 445110 NA48/S MAN (Kawasaki MAN B&W) turbocharger NA48/S Operating manual with spare parts list. 90 pages. 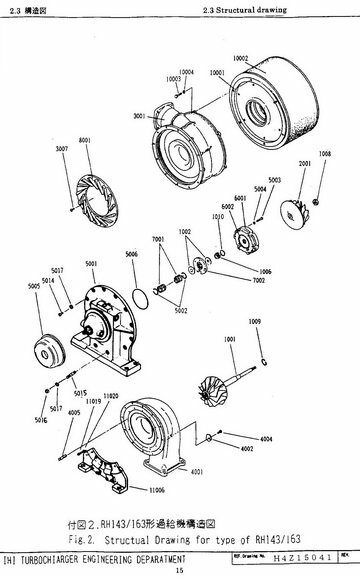 445120 NA48 MAN B&W NA 48 Turbocharger - Instruction Manual with Drawings and Part Numbers. RUSSIAN. 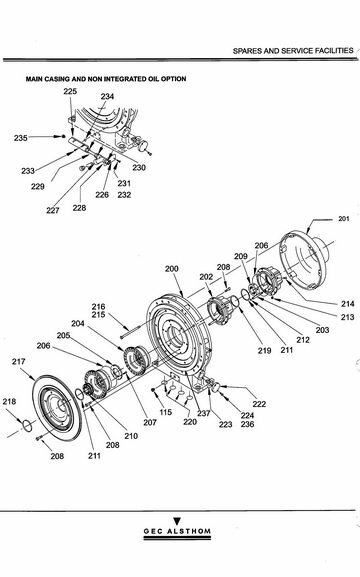 445130 NA57T9 MAN NA 57/T9 Turbocharger - Instruction for Operation and Maintenance. Working instructions, Work Cards & Spare Parts List. 445200 NR MAN diesel & Turbo NR Turbochargers Project Guide. Free Download. 445205 NR15/R NR 15/R MAN EXHAUST-GAS TURBOOHARGER (install on diesel engine 5 and 6 cyl. L23/30): Operating Manual, Working Instructions (Maintenance instructions), Spare Parts Catalogue (list of Assemblies and List of spare parts with sketch). Air coller (Dong HWA) Instruction. Expansion Joint for T/C outlet drawing with all figures. Drawings - Silencer with spark arrestor and turbocharger cleaning hose. 445210 NR17/S NR 17/S MAN EXHAUST-GAS TURBOOHARGER (install on diesel engine L21/31): Operating Manual, Working Instructions (Maintenance instructions), Spare Parts Catalogue (list of Assemblies and List of spare parts). 445300 TCA MAN diesel & Turbo TCA Turbochargers Project Guide. Free Download from MAN website. 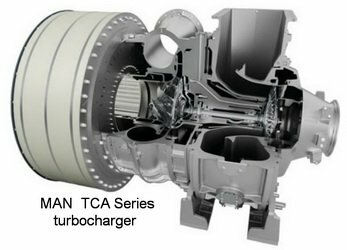 445310 TCA MAN TCA series turbocharger - Installation Instructions with Photos, Spare Parts with Drawings. 445400 TCR MAN diesel & Turbo TCR Turbochargers Project Guide. Free Download from MAN website. 445405 TCR MAN diesel & Turbo TCR Turbochargers - How to Dismantle. Free Download. 445600 VTA MAN diesel & turbo VTA Progect Guide - VariableTurbine Area for TCA turbochargers. Free Download from MAN website. 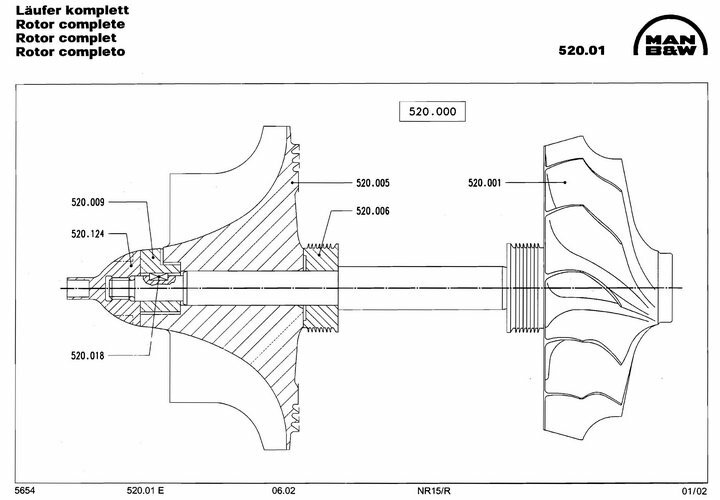 445601 VTA What is Variable Turbine Area (VTA). MAN diesel & turbo brochure. Free Download from MAN website. 446110 MET53SD MET53SD Mitsubishi Exhaust-Gas Turbocharger - INSTRUCTION BOOK Operation, Maintenance and Servicing, Part Number, Drawings. Specification MET 53SD - Description, Material specification, Cross Section, Assembly Drawing with all dimensions, Slinging procedure for overhaul, Tachometer installation drawing, Lubricating oil system, Arrangement of the dry cleaning device (drawing), Acceptable forces and moments on gas outlet flange, List of tools and spare parts with sketches. 446120 MET 66SE MET 66SE INSTRUCTION BOOK for MITSUBISHI EXHAUST-GAS TURBOOHARGER: Outline description, Installation and Piping, Operation, Maintenance and Servicing, Part Number, Drawings. Frequency Converter for Turbocharger. Tachometer Set for Turbo-Charger (Digital) 73R-AC-Cset and 73-DC-Cset types. 446900 MET SE83 Bearing removal on Mitsubushi MET SE 83 Turbocharger. Free Download. 447011 RH133, RH143, RH163, RH183, RH203 Yanmar Exhaust Gas Turbocharger RH133 (Foot in Bearing Housing) and RH133 Version Y (Bearing housing with foot / Semi-float bearing), RH143 / RH163 and RH143 / RH163 Version Y, RH183 / RH203 and RH183 / RH203 Version Y - Instructions for Operation and Maintenance. Spare parts order form. VIDEO Step by Step Instructions - Removing from engine, Disassembly, Cleaning, Re-Assembly, Installing onto Engine. Disc. Installation is not requiry. 447012 RH133 Yanmar Exhaust Gas Turbocharger RH133 (Foot in Bearing Housing) and RH133 Version Y (Bearing housing with foot / Semi-float bearing) - Instructions for Operation and Maintenance. Spare parts order form. These pdf files are part of 447011. 447013 RH143, RH163 Yanmar Exhaust Gas Turbocharger RH143 / RH163 (Foot in Bearing Housing) and RH143 / RH163 Version Y (Bearing housing with foot / Semi-float bearing) - Instructions for Operation and Maintenance. Spare parts order form. These pdf files are part of 447011. 447014 RH183, RH203 Yanmar Exhaust Gas Turbocharger RH183 / RH203 (Foot in Bearing Housing) and RH183 / RH203 Version Y (Bearing housing with foot / Semi-float bearing) - Instructions for Operation and Maintenance. Spare parts order form. These pdf files are part of 447011. 448105 295 Napier 295 turbocharger Instruction manual & Spare parts list. 106 pages. 448110 297 & 357 Napier 297 & 357 turbocharger Instruction manual & Spare parts list. 101 pages. Publication TB2971, issue 2, May 98. 448112 297 & 357 Napier 297 & 357 turbocharger Instruction manual & Spare parts list. 122 pages. Publication TB2971, issue 3, June 99. 448120 355 Napier 355 turbocharger Instruction manual & Spare parts list. 94 pages. 448130 357 Napier 357 Turbocharger & GEA Air Cooler - Instruction for Operation and Maintenance. Spare Parts List. 448135 457 Napier 457 turbocharger Instruction manual & Spare parts list. 166 pages. 449104 H3 Turbocharger H3. Instruction for Operation and Maintenance. Spare parts List. 449106 H5, H6, H7 Turbocharger H5, H6, H7. Instruction for Operation and Maintenance. Spare parts List. 449110 R3-2 KBB R3-2 Turbocharger for MaK 6 M20 - Operation, Maintenance & Spare Parts. 449120 R4-3 KBB R4-3 Turbocharger for MaK 8 M20 - Operation, Maintenance & Spare Parts. 449130 HPR3000 KBB Exhaust Gas Turbocharger HPR3000 - Instruction for Operation and Maintenance. Spare Parts and Tools List. Expansion Joint for T/C outlet drawing with all figures. Drawings - Silencer with spark arrestor and turbocharger cleaning hose. 449131 HPR4000 KBB Exhaust Gas Turbocharger HPR3000 - Instruction for Operation and Maintenance. Spare Parts and Tools List. 449132 HPR6000 KBB Exhaust Gas Turbocharger HPR6000 - Instruction for Operation and Maintenance. Spare Parts and Tools List. 449410 TK23H Turbocharger TK23 H. Instruction for Operation and Maintenance. RUSSIAN LANGUAGE. 449901 Turbo dry cleaning manual. Free Download.